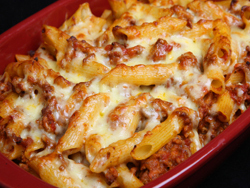 Here is one of my quick and easy pasta recipes. The Chili Noodle Casserole made with your homemade Chili Con Carne, tomatoes, mushrooms, cheese and noodles. A nice dinner idea when served with a side salad and crusty garlic bread. This is great for a busy day dinner. It can be made ahead of time and just quickly heat a single serving portion in your microwave. 4 cups Chili Con Carne. Combine chili and tomatoes in a large saucepan. Break up tomatoes with a spoon and bring to boiling. Pour into a 2 1/2 quart casserole. Add mushrooms, noodles, salt and pepper. Stir and cover. Bake in preheated oven for 45 minutes or until noodles are tender. Sprinkle cheese on top and bake another 5 minutes to melt cheese. Garnish with chopped green pepper or chopped cilantro. Or put a spoonful of sour cream on the top.